Everyone’s marketing team works hard to build a strong social presence for their brand. But how aware are they when it comes to the social presence of competitors? Social media isn’t an easy outlet to track on your own when you have multiple competitors. This is especially true today when most companies have multiple accounts – Facebook, Twitter, LinkedIn, Snapchat, and Instagram; all of which they’re posting to multiple times per day. But, there are a few different things you can view, at a high level, to see how your competitors are performing on social media and leverage it to better your own strategy. Focusing on one of the more popular platforms, such as Twitter, is a great place to start. Twitter is one of the most important social media tools for any size business to utilize. As one of the most popular networks, with 330 million monthly users, businesses should take full advantage of all it has to offer. Let’s take a look at how to best use Twitter to track your competition. To monitor all the accounts you want to track in one place, build a Twitter list. Twitter lists are a helpful feature that allow you to create a more personalized timeline, even inclusive of those you aren’t following, which means you don’t have to actually follow your competitors. This is a great way to curate a timeline of your competitor’s tweets. 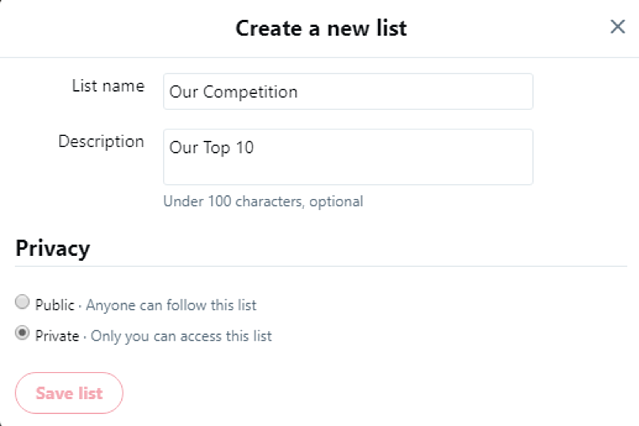 Twitter allows you to make these lists private, so your competitors won’t get notified you’ve added them to a list, and your new curated timeline will be only visible to you. Once you’ve curated your list, there will probably be a lot of activity feeding through. To only focus on the highlights, analyze the What, Who, When, and Why within each competitor’s tweets. What: What are they posting about? Do they have a new product release, an event coming up, or a new piece of content? Or are they simply sharing thoughts about what’s happening in the industry? Who: Who are they engaging with? Are they engaging with other competitors (think: fast food companies sending quirky remarks back and forth), are they using their platform to engage with industry influencers? All of those ‘who’ questions are important to understand part of their motives on social media, but the most important question: are they engaging with customers? If so, take a look at how their customers feel about them. You can learn a lot about your competitor by how their customers view them. Why: Why are they tweeting? The ‘why’ aspect encompasses all of the questions. Why are they suddenly sending out multiple tweets per day? Do they have a big product release coming up? Do they have a new piece of content? It’s common practice that if there is a big milestone coming up for a company, they are likely to share relevant content with their followers. Analyzing your competitor’s activity doesn’t need to be a daily exercise, but it’s important to have a strong cadence, monthly or quarterly, to stay on top of their activity. Make your findings easier to digest by breaking it down by competitor. Since Twitter is a platform where information is shared continuously throughout the day, focus on top performing tweets that seem to hold valuable information. Then, analyze the W’s mentioned above. What can you learn from your findings that can benefit your strategy? Not only can the analysis of what, who, when, and why your competitors are tweeting help you to better your social media strategy, but it helps your business as a whole. You now know critical information such as product releases, new hires, new content, key stakeholders, and more. This information holds value for your team to work together to keep your company’s competitive edge. The great thing about this process is that similar approaches can be used to analyze each of your top competitors across multiple social media platforms. Creating Twitter lists and analyzing your competitors' activity is a great way to start leveraging their social media footprint to benefit your business. If you want to gain more in depth insight into all of your competitors' social media activity and beyond, request a free demo of Crayon Intel Pro.